AEG offers engineered automatic lubrication systems to service single and multiple lubrication points on your machines. Our electric or air-operated lubrication systems are designed and manufactured to the highest quality, giving you a reliable system that will enhance your machinery. AEG also offers manual lubrication components such as air-operated grease guns and fittings. 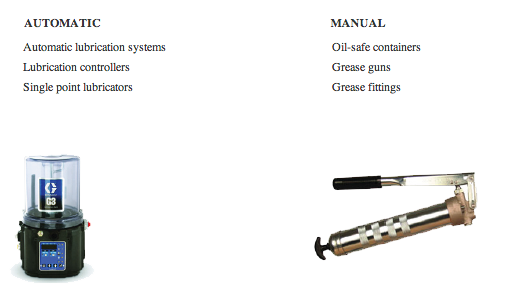 Reliable and efficient, our grease guns and fittings simplify your lubrication needs.